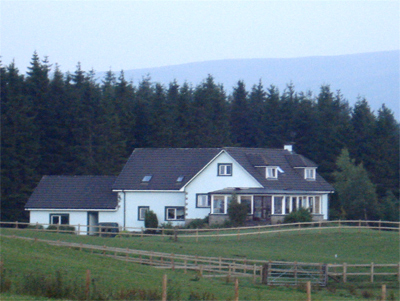 Proprietors, Peter and Ann Hunt, welcome you to their 250 acre farm, ideally situated in the beautiful Perthshire countryside, providing affordable accommodation near Gleneagles and within one hour's drive of Edinburgh or Glasgow. From the large conservatory you can see most of the farm, with Ben Vorlich as backdrop. Peaceful surroundings with superb views including your very own castle. The farm provides an ideal starting point for exploring beautiful Perthshire or further afield. Pitlochry Theatre, Edinburgh Festival, Burrell Collection are all within an hour's drive. Glasgow and Edinburgh shops also only an hour away. Children welcome. Horses welcome and dogs welcome if kept under control at all times. Perfect Golfer's retreat, within 3 minutes of Gleneagles Hotel golf courses. Our Coaching and Training Philosophy is based on developing confidence and offering a wide range of equine related activities with the welfare and interests of the horse a top priority and the aims of the riders tailored to match.